In the early days after my oldest son was diagnosed with type 1 diabetes, baked chicken breasts were one of the few foods that made my picky eater’s list. So I served them a lot! Over time I experimented with many different variations of baked chicken, developing his palate to accept new flavors along the way. Naturally, once I began the practice of freezing meals, marinated chicken became another big go-to freezer dish of mine. There are so many different versions to try, and they’re super easy to prepare. You can buy bulk chicken breasts to save money, make different marinades, and crank out as many meals as you’d like in a very short period of time. Plus, allowing the chicken all that time to marinate during the freezing and thawing process really lets it fully absorb all of the great flavors in the marinade. This recipe is proof of that. To be perfectly honest, the first time I made it, I was skeptical. I worried it would be too mustardy. However, the flavor it takes on is so surprising and delicious, and the chicken is so juicy and succulent, my entire family loved it. The addition of green beans makes it a complete healthy meal, and best of all… one that is easy on my son’s blood sugar. In a gallon-size plastic freezer bag, combine chicken breasts, mustards, and honey. Toss around in the bag until all pieces of chicken are well coated. Set aside. 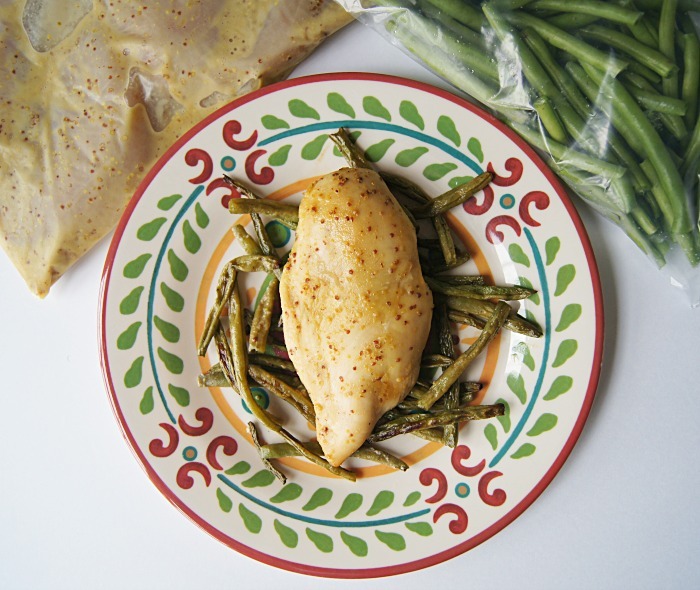 In a separate gallon-size freezer bag, add green beans, olive oil, salt, and pepper. Toss around in the bag to coat the green beans. Bundle both bags together in one large plastic bag. Label with meal name and date. Freeze until ready to use. When ready to serve, thaw both bags in the refrigerator, preferably overnight. Preheat oven to 350°F. Spray a large baking sheet with cooking spray. Spread green beans on the baking sheet in a thin, even layer. Top with the chicken breasts. Bake for 45 minutes to 1 hour until chicken is cooked through. Divide chicken and green beans evenly among six plates.